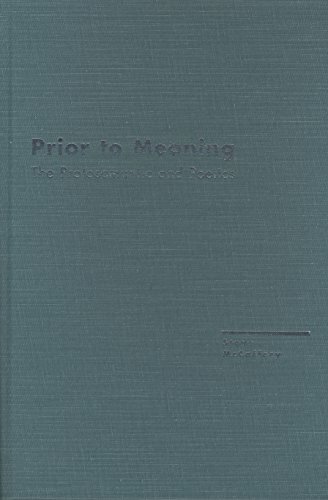 Prior to Meaning collects a decade of writing on poetry, language, and the theory of writing by one of the most innovative and conceptually challenging poets of the last twenty-five years. In essays that are wide ranging, richly detailed, and novel in their surprising juxtapositions of disparate material, Steve McCaffery works to undo the current bifurcation between theory and practice--to show how a poetic text might be the source rather than the product of the theoretical against which it must be read. Steven McCaffery (born January 24, 1947) is a Canadian poet and scholar who was a professor at York University. He currently holds the Gray Chair at SUNY Buffalo (Amherst). McCaffery was born in Sheffield, England and lived in the UK for most of his youth attending University of Hull. He moved to Toronto in 1968. In 1970, he began to collaborate with fellow poets Rafael Barreto-Rivera, Paul Dutton, and bpNichol, forming the sound-poetry group, The Four Horsemen. McCaffery's poetry attempts to break language from the logic of syntax and structure to create a purely emotional response. He has created three-dimensional structures of words and has released a number of sound and video works, often in collaboration with other poets.